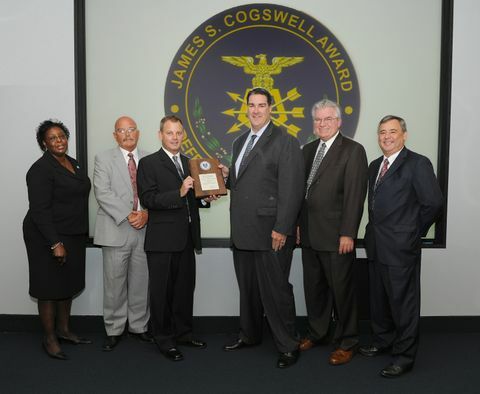 MELBOURNE, Fla., Nov. 9, 2012 -- The United States Department of Defense's Defense Security Service (DSS) has presented Northrop Grumman Corporation's (NYSE:NOC) Melbourne, Fla., facility with the prestigious James S. Cogswell Award for outstanding industrial security achievement. The DSS presents the Cogswell Award annually to a select group of security programs at cleared industrial sites that go well beyond industry standards and, in so doing, serve as an example to other cleared facilities. Only 26 of the nation's more than 13,000 cleared facilities received this year's award. The Melbourne site earned the honor, its third since 1995, after achieving two consecutive "superior" DSS ratings. Since learning of this year's award, the site has earned another "superior" rating. "We build the most advanced air systems in the world, and our customers and our warfighters trust the result, not just because the systems work well, but also because we've done it the right way," said Dale Burton, site manager for Northrop Grumman's Melbourne facility. "Every employee at this site understands that protecting information is at the heart of our commitment to protect our service members and our country." Northrop Grumman's Melbourne facility is a significant component of the aerospace economy on Florida's Space Coast. Noted as an airborne ground surveillance center of excellence, the site employs approximately 1,300 people and is home to programs for the U.S. Air Force, Navy and Army and the North Atlantic Treaty Organization.